From the Bay of Fundy to the Pacific Coast, Bill Linley has been photographing and writing about trains for over fifty years. He was introduced to train watching by his father in his native Toronto in the early 1950s and began photographing trains on the Quebec Central in 1959 while living in Ste Foy, Quebec. Bill shot the first of some 100,000 colour slides in April 1962 with a photograph of the Canadian Pacific’s Ottawa West Station. He began to focus on the CPR and particularly on the changes to railways in the Ottawa region, which he photographed extensively until 1970. While studying geography at Carleton University, Bill worked as a message router at the Sparks Street Office of Canadian Pacific Telegraphs. He later worked as a reservations clerk and ticket agent for the CPR at Ottawa Union Station selling their train travel experience. 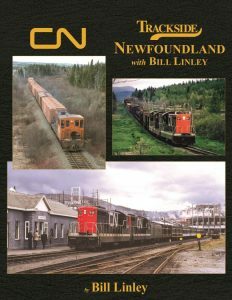 Bill made trips across Canada in the late 1960s trying to catch the last of traditional railway operations in PEI, Newfoundland and British Columbia. Always a fan of MLW/Alco locomotives, he pursued these engines far and wide, notably the FPA-4s on VIA in the 1980s. Following graduation from Carleton University in May 1969, Bill began a 33-year career in economic development with the governments of Canada, New Brunswick and Nova Scotia. His career took him across Canada where he often managed to photograph trains in the off-hours. He moved to Fredericton and Halifax where he was a director and oft-times treasurer of church and volunteer organizations. For a dozen years he owned and restored CN caboose 79510 and a boxcar that continue to welcome guests as part of the Train Station Inn in Tatamagouche, Nova Scotia. The caboose and a boxcar were re-modelled to provide first-class guest accommodation for persons seeking a unique railway experience. In 2009, Bill was featured as a waiter in the Train Station Inn’s dining car in an episode of CBC TV’s serial The Week the Women Went. Morning Sun Books published his first book: Canadian Pacific in Color: Volume 1 – Eastern Lines in 2003 and it sold out in 2008. In 2011, the sequel, Canadian Pacific in Color Volume 2, Western Lines was released. In these two volumes Bill describes the period prior to the advent of CP Rail from 1948 through 1968 when steam engines gave way to diesels across Canada. His next book, Trackside in the Maritimes 1967 to 1993 was published by Morning Sun Books in 2015. His latest book, Trackside Newfoundland, was published by Morning Sun in 2019. His photos and writing have appeared in a variety of magazines in Canada and internationally. As well, he is keen to contribute to the work of others engaged in the preservation of railway and industrial heritage. In 2002 he completed a brochure and contributed the text and photographs for an award-winning website on railway heritage for the Nova Scotia Railway Heritage Society of which he was a founding director. He was formerly a director and treasurer of the Orangedale Station Association that owns and interprets Nova Scotia’s oldest railway station. In 2015 he was the silver anniversary recipient of the Lifetime Achievement Award of the Canadian Railroad Historical Association. An increasing number of his slides may now be found in the fonds Linley at Exporail in St. Constant, Quebec. Current interests include cataloging thousands of his colour slides and digital images taken over almost sixty years. He is actively involved in a variety of community groups in Port Lorne, Nova Scotia and is chairman of the Nova Scotia Railway Heritage Society. For over thirty years he operated a home-based business, Signal Graphics, which dealt in quality Canadian railway books, DVDs and images. He and his wife, Marilynn, live in the historic Captain John G. Charlton house in Port Lorne on the Bay of Fundy near the Dominion Atlantic Railway.